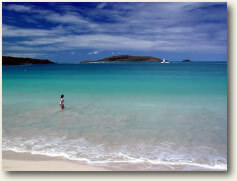 Spanish Virgin Islands Sailing Vacations Puerto Rico are the best kept secret of Caribbean cruise destinations. They offer unspoiled nature, culture and charm. The Spanish Virgin Islands or Passage Islands are a group of Islands and reefs which lie fifteen miles to the east of Fajardo, Puerto Rico and around 20 miles west of the US Virgin Islands. They are a part of the US commonwealth of Puerto Rico. For many years they have been off limits to cruising yachts because they were reserved for the United States Navy which used the Islands for war games and bombing practice. After many years fighting a war against this, locals finally won and have their islands back. They are now accessible for pristine sailing. 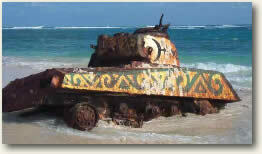 Many say they are like the rest of the Caribbean was some 30-40 years ago. If you like to get off the beaten track and appreciate quiet and preserved natural areas, you will adore these islands. The group of islands cover an area of 400 square miles and consists of two main islands Culebra and Vieques and some twenty smaller outlying islands. US Virgin Islands – US Virgin Islands. (Best option for bareboats rental is out of St. Thomas, USVI or in Tortola, BVI) but some do not allow sailing here, so you are better off getting a private captain only or crewed charter. US Virgins – Fajardo, Puerto Rico (sailing with the easterly winds for a comfortable ride and avoiding the up wind return). 4 hour sail from St. Thomas to Culebra. Fajardo, Puerto Rico (east end of mainland, 15 miles) departure and return. 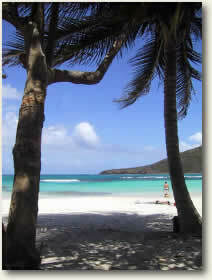 You can also ferry or fly to Culebra to meet your yacht and have even more time to play among the islands. You may want to combine this sailing itinerary with a few days to enjoy high lights of Puerto Rico like El Yunque rain forest, El Morro Fort and Old San Juan. 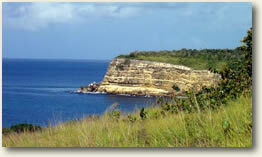 The cruising area has three separate locations, La Cordillera, Culebra together with its islands and Vieques. Each has its merits and attractions and on a weeks charter you should be able to visit the best of all areas. Depending on where you start and end your charter, the number of days in each area will vary. This twelve mile chain of small islands and reefs stretches from a point just a mile or so off NE Puerto Rico southeastwards and is part of Puerto Rico’s East Coast Marine Reserve. Diving and snorkeling here is nothing short of fantastic and good anchorage’s can be obtained during winter months in the lee of the easterly trade winds. 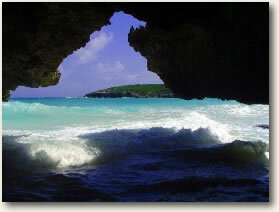 However Northerly swells and winds in excess of 15 knots can restrict the use of these Cays to a day anchorage only. There are mooring buoys in the area for the use of local dive boats that can be used to tie a dinghy so as to enjoy the beauty of the reef. None of these little islands offer anything in the way of supplies or services to visiting yachts, so if bareboating, make sure you bring your own. 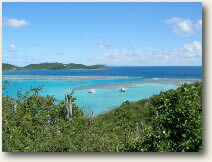 There are enough anchorages on Culebra and its smaller out cays to keep you happy for weeks. There is a quiet and roll free anchorage at the head ofEnsenada Honda just off the main town of Culebrasometimes called Dewey. The town is a delightful blend of Caribbean shanty and Spanish cultures and you will want to browse around after checking in with customs. Both Spanish and English (usually) are spoken. The centerpiece of the town is the red and white lifting bridge, spanning a narrow canal. The bridge is rumored to have lifted just once, on its day of inauguration some thirty odd years ago. It became stuck until engineers finally managed to close the bridge where it has remained ever since! There are several small bars and restaurants, which are open or closed at the owner’s whim. Nothing happens very fast here! After the bustle of the US Virgin Islands or Puerto Rico it can be refreshing, but the town closes early, so don’t expect rowdy night life. Every thing is centered on the harbor and canal, so you can get around by dinghy easily. Dakity Harbor is at the Southern end of the sound an idyllic anchorage protected from the swells by a pristine reef ideal for snorkeling. Further east is an anchorage so perfect as to appear in every cruisers top ten once they have visited it. Called Bahia de Almodovar, it has clear blue water over a white sand bottom protected by a reef even when the prevailing wind is blowing a steady twenty knots. Along the west coast of Isla Culebra, a stop at Playa Carlos Rosario, which hosts more of the best snorkeling in the area is in order. Continuing up the west coast you sail past mountains and secluded sandy beaches on our way to the northern tip of Culebra with rugged offshore cays of Peninsula Flamenco and along the north shore to the beautiful beaches of Playa Flamenco, Resaca and Brava. Stop at one of these areas for lunch and a refreshing swim in the crystal clear waters. Cross the Canal de Cayo Norte to the deserted Isla de Culebrita part of the Culebra National Wildlife Refuge. With its abandoned lighthouse, beautiful beaches, reefs and tide pools, the island has not changed much in the past 500 years. The island offers ample nesting sites for shore birds and is a very popular place for nesting sea turtles. Scuba diving and snorkeling is wonderful here. The waters are a divers dream; they are truly virgin reefs! Dive in the company of turtles, rays and enormous amberjacks. There is an unbelievable anchorage on the north shore of this small island. The lobster season is open all year round so enjoy catching your own Caribbean spiny lobster and plop it on to a beach BBQ a most memorable pleasure. Take a highly rewarding early morning climb to the small lighthouse atop this rocky island for a view of other anchorage’s and islands, yet to be visited. Truly spectacular! 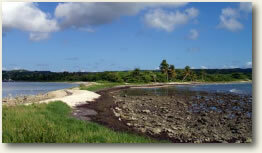 Cayo Luis Pena is another island off the west side of Culebra with a pretty anchorage in the bay on the NW side. In particular the beach on the right hand side as you approach. There is a reef with a break off the beach. Best snorkeling is along the southern edge of the bay. For much of the past century access to this island has been restricted by the US navy who have used it as weapons training area. It only recently has been opened for tourism and much of the Navy territory has been designated as a wildlife sanctuary. There are many wonderful anchorages. Arriving on Vieques visit the town of Isabel Segunda. Have lunch at a local restaurant while enjoying the architecture and general tranquility of this waterfront town. A great place to shop and provision (if bareboating). How about a fantastic dinner of fresh mahi-mahi and ice cold mojitos. There is an anchorage in the Western end of the island off the town of Esperanza. Here one anchors off town protected by an off lying cay and a peninsular of land. Dinghy trips ashore are rewarded by a selection of good local restaurants, bars and shops. 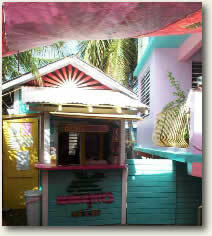 The is a good dive shop next door at Sunbay, a yellow sand beach, lined with palm trees. Heading east pass endless sandy beaches to the uninhabited east end of the island. Stop on a secluded beach for lunch and a cooling swim. Continue to the far east end of Vieques to Punta Este to anchor in a quiet bay to swim, snorkel or just relax on the boat, have a delicious meal just in time for a fabulous sunset. Along the south shore visit the famed harbor Ensenada Honda, a favorite ambush anchorage for pirates. Bahia Salinas del Mar is another “must see” along the way. The coast line along the south shore is pristine and great for a kayak excursion. Paddle along rock walls and coral reefs with the colorful sea fans and hard corals that pass inches below your kayak.